Last week the Colorado Department of Education released growth percentile ratings for schools and districts as they relate to the spring 2015 and spring 2016 administration of the PARCC English Language Arts (ELA) and Math tests. Growth percentiles are intended to measure the rate at which student populations are improving in achievement in comparison to the rest of the state. This is the student performance metric I put the most value in, as we know we can't control the academic condition kids arrive at our doors with. We can, however, impact how much a child learns over the course of a year they spend with us. In growth terms, this means we would like to be over the 50th percentile in each tested measure in order to show we are achieving more than a year's growth in a year's time for our children. Additionally, having strong growth scores is key to achieving a higher accreditation rating for our individual schools and for our district. Based on spring 2016 testing we are outgrowing the average district in the state of Colorado in both English Language Arts and Math. Our ELA composite is at the 52nd percentile. Our Math composite is at the 53rd percentile. By comparison, all our composite growth results from the last time we received such measures in 2014 in the 46th to 47th percentile range, below the state average of 50. 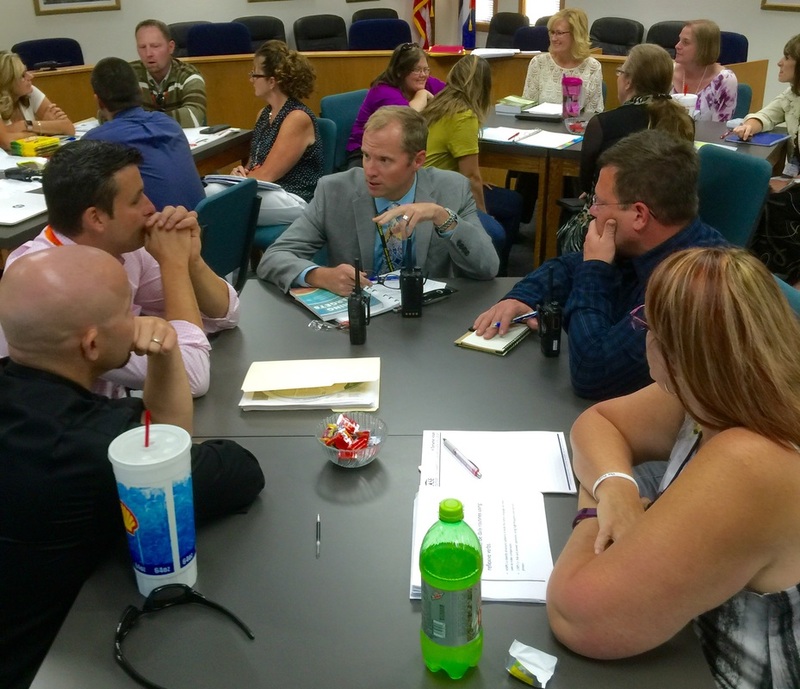 We believe this could lead to an improved district accreditation rating for the district. Our last accreditation score was 55.6-Improvement. We’ll need to score a 64 or higher to move up to full Accreditation. We don't know the full intricacies of how these results will play into the new state accreditation formula, but we believe based on these growth percentiles and the general improvements we made in proficiency our score will be higher than it was in 2014. It would truly be something to celebrate as a district if we improve our accreditation rating. We should get preliminary accreditation ratings by early October. From 2014 to 2016 CCSD has improved English Language Arts growth from the 46th percentile to the 52nd percentile. From 2014 to 2016 CCSD has improved Math growth from the 43rd percentile to the 53rd percentile. CCMS has composite growth results above the 50th percentile in both subjects, with 54 in Math being their highest. They are an improvement school and their accreditation score will go up, perhaps enough to increase their rating to performance as well. CCHS remained below the 50th percentile in ELA (48) and in Math (47). However, the 47 in Math was actually an improvement over 2014 performance. Our long term goal is to increase both of these ratings to where they are above the 50th percentile. In the mean time we expect their accreditation rating to remain the same at improvement. 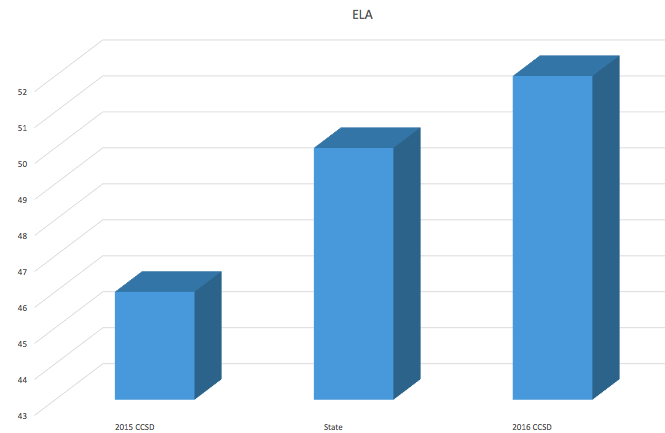 CES has composite growth above the 50th percentile in both test areas, including a whopping 64 in ELA! Their accreditation score should remain at the highest level it can be for an individual school, performance. Harrison, measured on a grade K-8 scale, had both growth percentiles below the 50th. ELA was 48, Math was 47.5. Most interestingly, however, is that the middle school (grade 6-8) population generally outgrew the elementary population. This did not happen in 2014. Harrison was rated as an Improvement school back then. They will most likely remain at this level. Lincoln School of Science and Technology grew above the 50th percentile in both tested areas, with a whopping 71st percentile in ELA! This is simply phenomenal! Lincoln, too, will remain at the highest level it can be for an individual school, performance. Last Monday Board Secretary Mary_kay Evans received a McGuffey Award for outstanding work as a board member. Mountain View Core Knowledge School had the highest combined growth percentiles at the 63rd in ELA and 62nd in Math. This is outstanding! They will no doubt be a performance rated school once again. Washington Elementary scored at the 50th percentile in ELA and the 66th percentile in Math. In fact, their growth performance in Math was the highest in that subject area in our district! We believe this should help to keep their rating at the performance level. On their last accreditation rating in 2014 they scored performance by a margin of 1 point. On Monday September 19th Cañon City Schools board of education secretary Mary-Kay Evans was honored by the Colorado Association of School Boards with a McGuffey Award for service to our school district above and beyond the call of duty! Mary-Kay received this honor because, along with being an excellent board member, she volunteers in many of our schools, supporting the Cañon City High School Tiger Pride Booster Club, as well as reading initiatives at Washington Elementary School. In only her third year on the board, Mary-Kay was instrumental in exploring and advocating for the implementation of the Lindamood-Bell reading intervention processes for struggling readers in the district. Not only did she see the value in securing training for our teachers this process, she volunteered a week of her time last summer to participate in the training, thereby modeling its importance to our teaching staff and gaining a better understanding of how it works. Through her focus on supporting struggling readers Mary-Kay has also advocated for a scotopic sensitivity screening process which, once implemented, will be able to rule out vision issues as being a primary reason why some students continue to struggle in their ability to read. Mary-Kay, we thank you for your advocacy for student learning and we congratulate you upon receiving this honor! Director of instruction Adam Hartman presents to instructional leaders about why it is important for teachers to plan high quality learning targets for lessons. At the beginning of each lesson, the teacher will communicate an appropriately rigorous learning target, in kid friendly language, using the method: who will be able to do what, how. This target will be clearly aligned to our district curriculum map and relevant to the future of each student. Teachers will continuously monitor their classes, making use of strategies that actively engage all students in achieving the daily learning target. The teacher will use a variety of effective formative and summative assessments to measure student learning and guide further instruction. With this accomplished, the focus of our effort has now been placed on ensuring our instructional leaders are armed with the skills they need to coach and support teachers to incorporate these three foundations into every lesson, every day. This work began last Tuesday with a wonderful session focusing on why it is important to plan effective learning targets, and how instructional leaders might support teachers in doing so. We then began work on how each instructional leader can establish and facilitate effective professional learning community work in their building. Our effort toward this ran a little long on Tuesday, and so we will pick it up again at our October session where we will also work to support teachers in establishing fair and valid measures of student learning to be used in their annual evaluation process. CCHS principal Bill Summers meets with Colorado Workforce Center leaders about setting up job shadow and internship opportunities for students. Last Monday I was in Denver to work with the Colorado School Finance project to update their cost study quantifying what it costs to educate a child in Colorado. I ended the day in Colorado Springs to attending the CASB Regional meeting with board members Mary-Kay Evans and Shad Johnson. 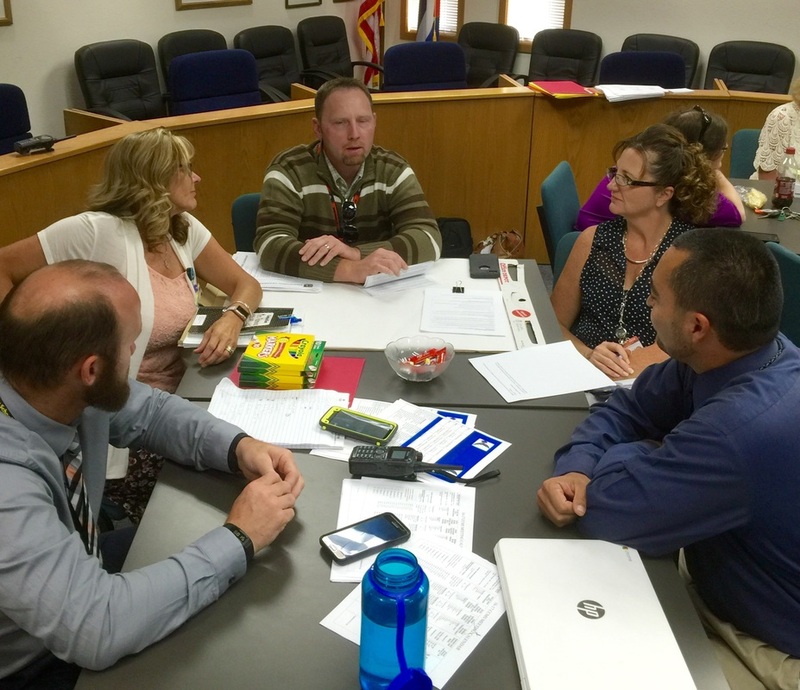 On Tuesday we held our district-wide instructional leader PLC. On Wednesday I held an evaluation meeting with one of our directors, and attended a regional superintendent's meeting, and participated in a parent engagement session about the future of our facilities at Washington Elementary School. I started the day Thursday with another parent session about facilities at Washington, I then attended a meeting with CCHS staff and Colorado Workforce personnel aimed at establishing a partnership to provide our high school students with job shadowing and internship opportunities. I then spent a good portion of the rest of the day reviewing board policies that are up for revision, while also attending a quarterly PCC-Fremont Campus advisory meeting. I ended the day on Thursday at the ECHO Council legislative symposium. On Thursday Washington principal Brian Zamarripa presented results of a parent survey related to facility options. On Monday I’ll attend our Literacy Team Professional Learning Community session, and will have lunch with board president Larry Oddo in advance of our board work session and meeting. 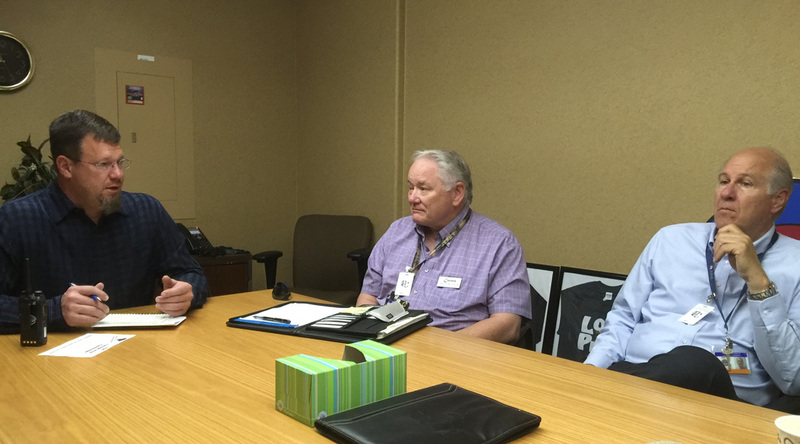 Tuesday is filled with a series of meetings with directors and facilities experts. On Wednesday I’ll attend a regional health and wellness grants progress meeting, and I’ll stop in at Harrison K-8 to see how their literacy consultant visit is going. On Thursday I have a meeting about our Expelled and At-Risk Student Support Services grant, a meeting with our CDE Early Literacy Grant consultant, and a meeting with our District Evaluation Council. On Friday morning I have another meeting about our Early Literacy grant, a facilities planning meeting, and a meeting about new federal education programs requirements.